On April 21, 2018, the Institute for Contemporary Art (ICA) at Virginia Commonwealth University (VCU) will open to the public. The ICA will debut with its inaugural exhibition, Declaration, an exploration of contemporary art’s power to respond to pressing social issues through the voices of 34 emerging and established artists from Richmond and around the globe. 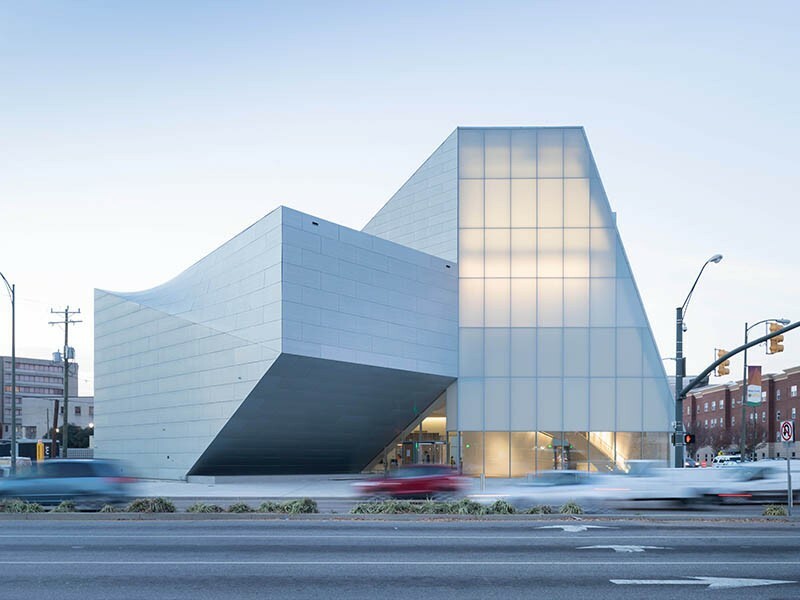 The ICA is Richmond, VA’s first art institution dedicated exclusively to exhibiting contemporary art and will be a significant cultural resource for Richmond and VCU, in direct dialogue with the VCU School of the Arts, the #1-ranked public school of art and design in the U.S. The open design of the ICA features dynamic exhibition and programming spaces that can support widely varied forms of contemporary art. The glass walls and windows create continuity between the interior and exterior spaces of the building. On the first floor, a 4,000-square-foot gallery, café, bar, and concept shop radiate from the ICA’s central forum and frame an outdoor garden. The “Thinking Field” garden will be used for social gatherings and public programs. The first floor also features a state-of-the-art, 240-seat auditorium for film screenings, performances, lectures, and other programs. The second floor includes two forking galleries and an adaptable “learning lab” for interactive engagement. It also includes a publicly accessible terrace, featuring one of four green roofs. The third floor features a gallery with soaring, 33-foot-high walls and houses one of the administrative suites and the boardroom. Additional staff offices are located in the building’s lower level, which also includes a lobby for visitors, art storage and preparation facilities, a fabrication workshop, a green room, the catering kitchen, and general storage. In keeping with VCU’s master sustainability plan, the ICA’s design incorporates state-of-the-art technologies and environmentally conscious design elements and makes use of numerous natural resources. The pre-weathered, satin-finish zinc exterior of the Markel Center, which houses the ICA, includes interspersed clear- and translucent-glass walls and skylights that infuse the building with natural light and lessen reliance on nonrenewable energy. Geothermal wells provide heating and cooling energy for the building, and four green roofs absorb storm water, offset carbon emissions, and maximize insulation. Native plantings include wood oats, little bluestem, Pennsylvania sedge, and goldenrod. Building materials include Virginia bluestone and custom glass cavity walls, designed to exhaust heat in the summer and harness it in the winter. The project is designed to meet LEED Gold Certification standards.